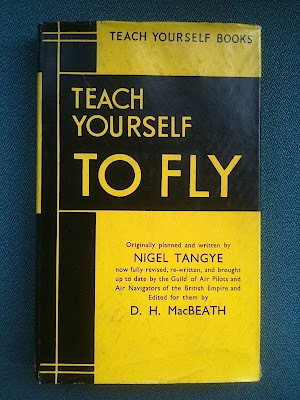 My favourite title on sale was Teach Yourself to Fly, possibly used by TM in their 'yogic flying' levitation attempts but also useful for owners of light planes. 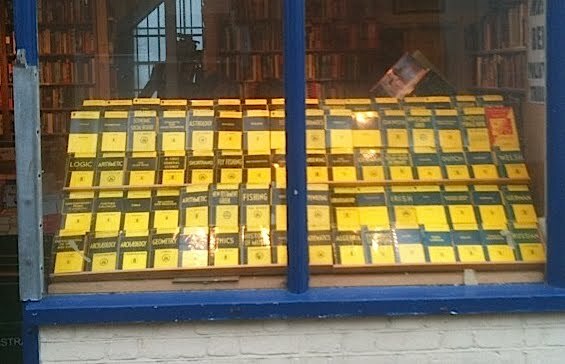 It would have been good if it was local hero Benjamin Britten's copy. At one point he had a plane parked in a Suffolk field to fly to gigs in Europe, i know this because I cleared the library of his pilot's widow. It did not go on for long because, although he could be back home at the Red House in time for supper after a busy day in Amsterdam, the insurance was prohibitive. The most expensive T.Y. title on the net is Teach Yourself Welsh at £400 but the seller is 'with the fairies' as it can be had in better condition for 37 pence. The most consistently expensive title is by the great needlework expert Mary Thomas Teach Yourself Embroidery, one of the earliest titles. An old respected modern first dealer wants £100 for a 1938 decent copy in a 'very slightly frayed' jacket. Sans jacket the 1938 can be had for £3 and there is even a copy for a fiver in an embroidered jacket, presumably done from the book. I suspect the £100 copy will be there for many years, unless collecting such books become a craze. Outlook? Patchy and uncertain, but as penny shares they are unlikely to tie up much money; go only for smart copies in decent jackets. Stumbled on this post while trying to verify a Teach Yourself printing date. I don't know if I count as a 'collector' but I do have a fondness for the older books on languages. Some of them are quite good, most are useless [although the newest Greek and Hebrew ones are good! ], but I still like their grammar-heavy approach. As a result I've accumulated a shelf of various titles in various formats, rather than the uniform format of your bookseller. Also, there was a "angry young man" sort of movie in the 60s that I saw on TV in which the disaffected youth lived in an attic and taught himself about the world with TY books; pre-Google of course. Never been able to remember the title, alas. I have a huge collection of Teach Yourself books that I need to sell - taking up too much space that is needed for other things! I have a huge collection of Teach Yourself books that I need to sell - taking up too much space that is needed for other things! Contact me if you are interested! Hi. Do you have any left? Yes, they are all available as I haven't had time to put them on eBay etc.